On February 19, 1862, with armies drilling for the spring Civil War campaigning season, President Abraham Lincoln issued a proclamation. “It is recommended,” he wrote, “to the People of the United States that they assemble in their customary places for public solemnities on the twenty-second day of February instant, and celebrate the anniversary of the Birthday of the Father of his Country, by causing to be read to them his immortal Farewell address.” That was all. Lincoln didn’t say anything about “sale-a-brations” or “Buy George” savings on dinette sets. He certainly didn’t realize that through the years his original concept of a near sacred holiday for the reading of Washington’s most succinct manifesto would blur into a meaningless thing, a Monday without mail called Presidents Day. It is safe to say that neither Washington nor Lincoln could ever have imagined the extent to which their likenesses would become commercialized. If that smacks of religious fervor and a compelling need for faith, it is probably because Lincoln’s attitude toward the nation and the community of belief that sustained it did rise to the level of a political religion, as he once termed it. The public didn’t greet the notion of a political religion with much excitement, though, and so Lincoln stopped trying to explain it early on. But he continued to live it. Lincoln was inspired as a young man by the biography of George Washington by Parson Weems. 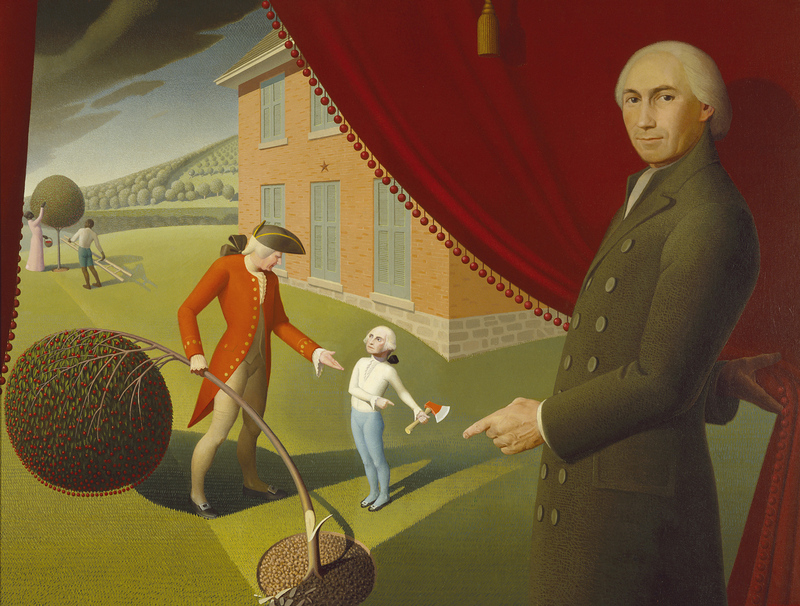 The artist Grant Wood spoofed the book's depiction of the Father of Our Country in his painting "Parson Weem's Fable" in the Amon Carter Museum of American Art. 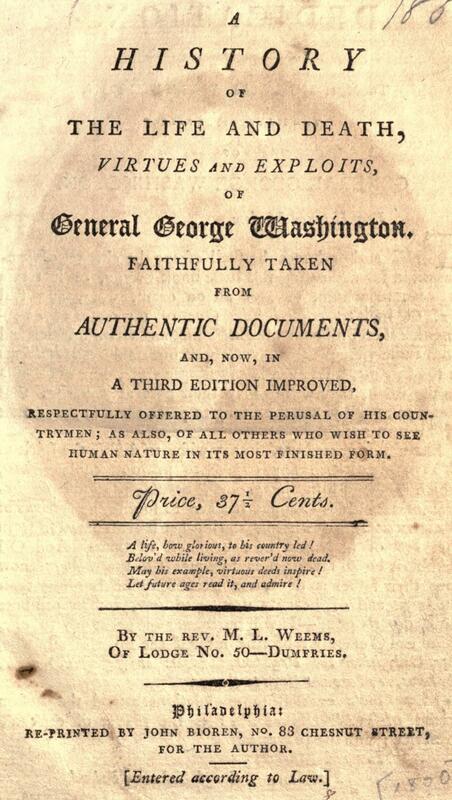 Two of the books that Lincoln is known to have read as a boy were biographies of George Washington. One, by Parson Weems, stressed a fact that has long since become a cliché: that if a boy is honest, virtuous, and hard-working, as George Washington was, then he will almost certainly succeed in the America that Washington left behind. Like all clichés, it has a strain of truth in it, and never more than in the case of Abraham Lincoln. He was honest and he was virtuous. He was also hard-working, at least sometimes. All of those traits must have been part of him through breeding or upbringing, but the specter of Washington may have served to hold him to the highest standard even in the tightest squeezes, as the example of an idol can do. The Weems biography of Washington had a profound effect on Lincoln. More information on the book is at Mount Vernon. The Weems biography was also influential for Lincoln in its emphasis on Washington’s Farewell Address. 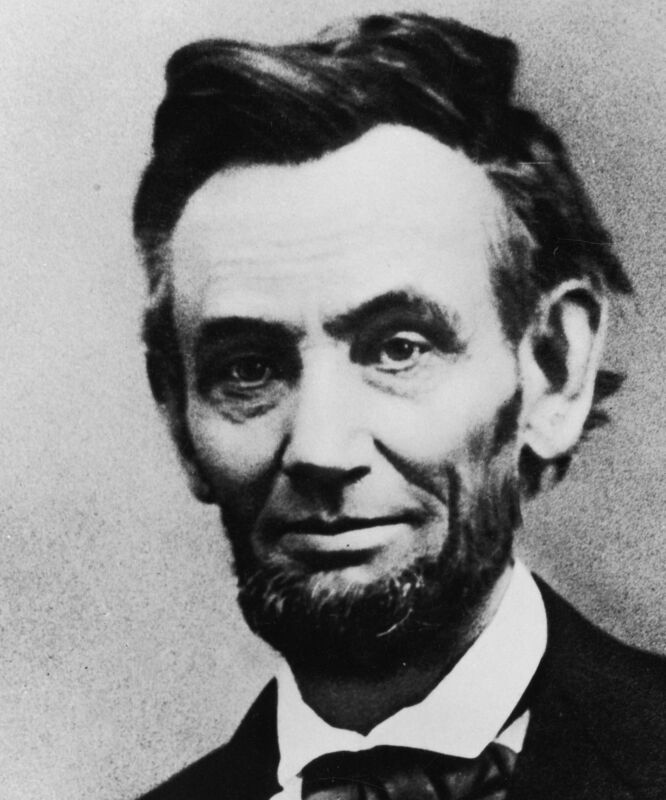 That was a speech that remained paramount in Lincoln’s thinking both as an interpretation of the documents that formed the nation and as a set of directives based (unlike those documents) on actual experience. “I can clearly foresee that nothing but the rooting out of slavery can perpetuate the existence of our union,” commented Washington. He may well have been speaking of the differing regional views of slavery. Washington said elsewhere that “I can clearly foresee that nothing but the rooting out of slavery can perpetuate the existence of our union.” That job, the rooting out of slavery, as well as of course the preservation of the unity of government, was left to the willing inheritor of Washington’s directive, Abraham Lincoln. Where Washington was the acknowledged leader of eight or ten truly brilliant Americans in the formation of the country, Lincoln was strangely alone three generations later, when the Founders’ legacy reached the brink of disintegration. They were the Founding Fathers. He was just Abraham Lincoln of Illinois. Washington would have appreciated Lincoln as well, we can guess, though perhaps not with quite the same intensity. When Lincoln was alone, he had, at least, Washington. George Washington, for his part, was never alone, but the evidence suggests he would have respected Lincoln’s renewal of the unity of government and the fact that he purged the country, once and for all, of slavery. But he wouldn’t have liked those off-color stories, even if he was the beneficiary of the belly laugh.